Any society that tolerates this systemic exploitation and corruption as “business as usual” is not just sick–it’s hopeless. In noting that our society is sick, our economy exploitive and our politics corrupt, I’m not saying anything you didn’t already know.Everyone who isn’t being paid to deny the obvious in public (while fuming helplessly about the phony cheerleading in private) knows that our society is a layer-cake of pathologies, our economy little more than institutionalized racketeering and our politics a corrupt auction-house of pay-for-play, influence-peddling, money-grubbing and brazen pandering for votes. The fantasy promoted by do-gooders and PR hacks alike is that this corrupt system can be reformed with a few minor policy tweaks. If you want a brief but thorough explanation of Why Our Status Quo Failed and Is Beyond Reform, please take a look at my book (link above). If you want an example of how the status quo has failed and is beyond reform, it’s instructive to examine the pharmaceutical industry, which includes biotech corporations, specialty pharmaceutical firms and the global corporate giants known as Big Pharma. “Already this year, Valeant has increased the price of 56 of the drugs in its portfolio an average of 66 percent, highlighted by their recent acquisition, Zegerid, which they promptly raised 550 percent. Not only does this have the unfortunate side effect of placing the price of life-saving drugs out of reach for even moderately-insured people, but it has now begun to call into question the sustainability of this rapidly-spreading business model. Longtime correspondent John F., M.D. has been sending me a steady stream of media accounts of pharma companies jacking up prices by 400% and 500%, even though the medications are off-patent and have been around for years or even decades. “The Epi-Pen (or the generic equivalent) is the only thing that people with severe allergies – including many children – can carry that will save their lives if used at the start of a severe allergic reaction. There is no substitute. The maker, Mylan, has increased the price six-fold over the past few years. Epinephrine is a very old generic drug. It is the packaging that makes it patentable. There is absolutely no reason for the cost to make Epi-Pens to have increased. People who have had a life-threatening allergic reaction to food or insect stings need these – they are absolutely essential to save their lives. Epinephrine has been generic since I was in medical school in the ’70s, yet the FDA have allowed the manufacturer to increase the price 600% in the last few years. Unsurprisingly, pharma sales have been soaring. 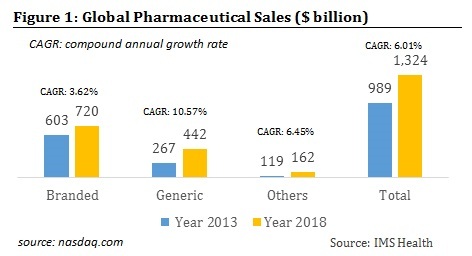 Take cheap generic drugs and jack up the price by 400%, and it’s no surprise that sales have risen from $550 billion annually in 2004 to over $1 trillion in 2014. All of the exploitation, deception and corruption has been well documented in dozens of reports and books. Here is a small sampling of recent titles on the sickness of our pharmaceutical/”healthcare” systems, the political system that funds and enforces these pathological systems and the tragic consequences of these pathologies. I have been a physician for 10 years. I have seen my profession gradually being taken over by the pharmaceutical industry. I have seen countless patients harmed – alas even killed – by drug reactions and polypharmacy. I have sat and listened to countless drug representative presentations that were outright falsehoods and misrepresentations. It has been months – maybe even years that I have had available to me a medical education conference that was not somehow tainted by drug company money and therefore propaganda. I have repeatedly had patients in my office begging me for medication that they do not need. They want it simply because it was on TV News last night – and came with a promise of metaphysical salvation. I spend much time every day dissuading patients from taking medication they simply do not need – indeed may even cause real medical problems. The issues that are discussed in this book are very very real – and the scary part is I do not see my fellow physicians doing a single thing to address these huge problems. Abramson gives specific examples where published drug studies focus on recipients non-representative of typical (target) users – eg. younger, and less prone to adverse reactions. Sometimes the reported data show (if one has the time to read carefully) that the true targets do WORSE with the medication, and this finding is obscured by positive results with the more numerous (atypical) younger selected test patients. Other medical research reporting ploys utilized by drug companies include: 1)reporting initially positive results, while omitting adverse subsequent outcomes, 2)combining serious (when increased) and minor (when decreased) adverse event numbers to cover up problems, 3)comparing a strong dose of a new medicine with an inappropriate weak dose, comparing a new drug with a placebo, instead of existing efficacious drugs, 4)not reporting negative drug trials, 5)failing to point out that lifestyle changes often provide much better results than drugs, and 6)pulling advertising from medical journals running unfavorable articles. As a consumer who believed until recently was an “informed consumer,” I was shocked to discover that the information I was getting on the National Institute for Health’s website “pubmed.org” was less than definitive when it came to clinical trials. With Dr. Abramson’s book, I now understand that those clinical trials, which most doctors depend on in helping them treat their patients are wildly distorted. I applaud Dr. Abramson for writing this book. Just as Rachel Carson’s book “Silent Spring” served as a catalyst for supporting changes in how we respect our environment, physicians, consumers and politicians should read this book and take action to protect our nation’s health. “In the U.S., we spend enormous sums on health care, much of which has little or no effect. This system is fiercely defended by those whose incomes and power come directly or indirectly from the nearly one-fifth of American GDP that health care absorbs. Any society that tolerates this systemic exploitation and corruption as “business as usual” is not just sick–it’s hopeless. No, you can’t fix this layer-cake of pathological deception, exploitation, corruption and racketeering with the usual pathetic “reforms” offered by lobbyists, insiders and think-tank lackeys: the status quo is itself the source of the sickness and the rot.